New York is forever on the verge of some kind of collapse. We worry about the next big storm. Or a the next economic downturn. Or just a good ol’ rat tsunami. But last year, the New York City Economic Development Corporation (or NYCEDC) called our attention to a very immediate—and underreported—crisis: The decay of thousands of piles that support the city’s riverfront. Pilings are the wood or steel columns that hold up the piers that edge the city. They're often anchored a dozen or more feet below the waterline, and they need to withstand pummeling by storm surges, sea salt, and plain old wear and tear. The problem with the rotting pilings is that it’s mind-bogglingly expensive to repair them—far more costly than whatever’s being built up top. Over the next few decades, the city will probably spend billions of dollars reinforcing the 300-odd miles of riverfront land they own. It’s either that, or let it all fall into the sea. It’s the kind of unglamorous problem that’s going to confront the city more and more often as it ages. In December, the NYCEDC launched an open call for alternative ways to fix up the pilings, asking the hivemind of local engineers and designers to come up with cheaper, smarter methods. 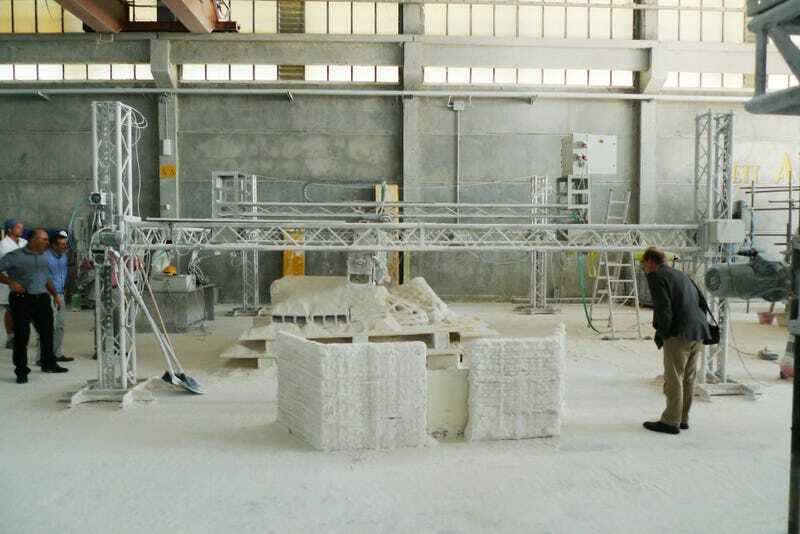 Several weeks ago, the group announced an unlikely winner: D-Shape, the famed Italian concrete 3D printing company, which received $50k for a concept that would 3D scan the old pilings and 3D print concrete reinforcements. Here’s how their scheme would work. A team of workers would use a 3D scanner to take accurate reading of each piling. Then, based on the scans, they’d use a generative algorithm to create the ideal structural reinforcements for each piling. The team at D-Shape would print each column and pack it in an inflatable raft, which would be towed into the harbor and slowly deflated. 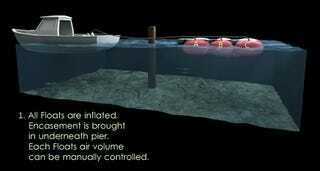 That would allow a team of divers to control the placement of the reinforcements, as they sink into the harbor. All in all, the team estimates the plan could save the city $2.9 billion dollars. And if the city decides to test it, the project could be the first successful example of 3D printing at an infrastructural scale. Dini beneath one of his creations. Brandon is in charge of raising capital for the first stateside D-Shape (he hopes to have one up and running by December, but refuses to say how much it’ll cost). Part of his job is to prove what the D-Shape can do, with projects like the piling reinforcements. He's also heading up a collaboration with the European Space Agency to test the idea of 3D printing habitats on the moon, and recruiting artists to sculpt using the D-Shape. The idea, he explains, is to capture the public’s imagination and pique the interest of companies who might be interested in investing. Piling repair isn’t as exciting as all that, but it combines the benefits of the machine with all the good stuff about precast concrete (it’s cheap!) and cast-in-place concrete (it’s high quality!). Brandon stands with a sculpture printed on the D-Shape, image via. The D-Shape itself—and thus the piling repair project—are a long way from being ready for widespread use, and it's likely to be a long time before reliable structural components will emerge from the bed of the machine on a regular basis. But as a think piece about how rapid prototyping could eventually solve unique infrastructural problems, their plan is spot on. Maybe Dini was only slightly off the mark: D-Shape wasn't meant to print new structures, but to print improvements to the old ones.